Iowa's Seventh General Assembly adopts a charter to establish the "people's college." The bill is signed by Iowa Governor Ralph P. Lowe and establishes the State Agricultural College and Model Farm. An appropriation of $10,000 is made to purchase land and finance improvements. Story County is selected as the site for the Iowa Agricultural College. The original farm of 648 acres is purchased for $5,379. The college is founded on the ideals that higher education should be accessible to all and should teach liberal and practical subjects, ideals that are integral to all land-grant universities. The Farm House is the first building on campus. It is built from materials found locally and bricks made on campus. 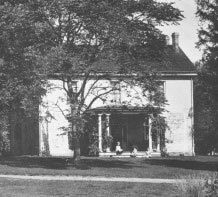 The college farm managers and superintendents live in the house in the early 1860s. The house also is home to the first two presidents of Iowa State, and later the Deans of Agriculture make it their home. 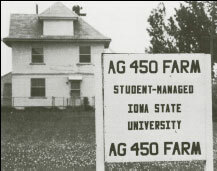 College and university faculty live in the Farm House until 1970. 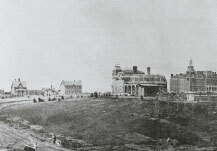 The Morrill Act is signed by President Abraham Lincoln on July 2. On September 11, the Iowa Legislature accepts the provisions of the Act, which makes Iowa the first state in the nation to do so. The Morrill Act endows federal lands to establish a college of agricultural and mechanical arts in each state. Iowa Agricultural College and Farm opens as the first coed land-grant in the nation. 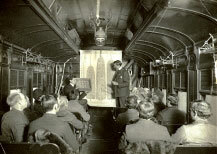 The first class consists of 136 men and 37 women. College president Adonijah Welch conducts first extension programs, known as "Farmer's Institutes," offered by a land-grant institution. Charles Bessey, a faculty member until 1884, is recognized nationally as an expert in plant pathology, and his "Diseases of Plants" is among the first books to outline the scope of plant pathology in America. First laboratory work in the nation is in undergraduate botany instruction. Iowa State graduates its first class of 26 students—24 men and 2 women. 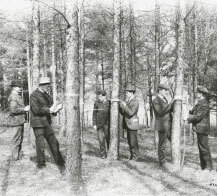 First forestry courses are offered in the nation. Iowa Agricultural College awards its first Master of Science degree to J.C. Arthur, a student in botany, who goes on to become an expert on rust fungi. Nation’s first course in dairying is offered. The Hatch Act provides for the establishment of agricultural experiment stations at land-grant colleges. Seaman Knapp and Charles Bessey, both professors at Iowa Agricultural College, help author the act. Horticulture is the first agricultural discipline to be organized as a separate department. Iowa Experiment Station is established. Iowa Agricultural College offers the first course in bacteriology in the nation. 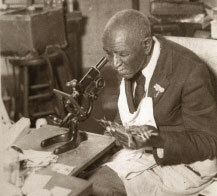 George Washington Carver receives his master's degree in horticulture and leaves for the Tuskegee Institute where he discovers new uses for peanuts, sweet potatoes, and soybeans. 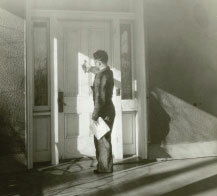 Carver is the first African-American student and faculty member in the Iowa Agricultural College. Iowa Agricultural College and Model Farm is renamed Iowa State College of Agriculture and Mechanic Arts. Livestock judging team wins first place at the International Livestock Exposition in Chicago. First master’s degree in farm mechanics in the nation is granted. First county cooperative experimental extension farm opens in Sioux County. Farmers wanted research done in northwest Iowa because growing conditions differed from the state college location, which was 200 miles away. The farmers provide the land, labor, and money for experiments. The agreement provides the first basis for extension work throughout the United States. Perry Holden, professor of agronomy, travels around Iowa with his “corn train” educating farmers on the importance of selecting and testing seed corn. First comprehensive report on Iowa soils is issued, emphasizing that different soils require different farming methods. First-in-the-nation professional agricultural engineering department and degree program in the nation is created. The Agricultural Extension Act becomes law in Iowa. Perry Holden is the first Iowa Extension director. J.B. Davidson is the first president of the American Society of Agricultural Engineers. Agronomists set up the first long-term experimental plots south of Ames. Smith-Lever Act brings together federal, state, and county governments as Cooperative Extension. Iowa’s extension program is 10 years old. 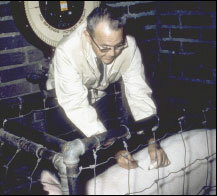 Eldon Quaife, first swine extension specialist, is credited for developing the first farrowing stalls. Nation’s first social survey of rural communities is completed. The first agricultural engineer degree in the world is granted to Jacob E. Waggoner. Henry C. Wallace, an 1892 graduate, appointed Secretary of Agriculture under President Warren Harding, serves until his death in 1924. Bert Benjamin, an 1893 Iowa State College graduate, invents a tractor that can cultivate row crops. 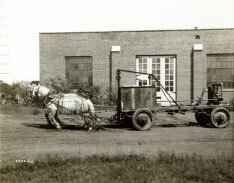 Iowa Experiment Station receives its first patent in 1926 for a device measuring the strength of horses in pulling contests. MidWest Plan Service opens as the first regional cooperative effort of land-grant universities to distribute research information and building plans. First experiment station research farm at Kanawha is established. Jay Lush, Iowa State professor, begins work that becomes the scientific basis for improving livestock through breeding. First laboratory to apply statistical methods to agricultural research is established. Henry A. Wallace, a 1910 graduate, is instrumental in the development of hybrid corn. He serves as U.S. Secretary of Agriculture until 1940. He is elected vice president of the United States with President Frank-lin D. Roosevelt in 1941. First regional swine breeding farm in the nation opens. Experiment Station microbiologists Clarence Lane and Bernard Hammer develop a process for making a blue cheese from homogenized milk. 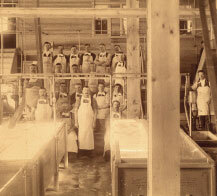 It becomes the industry standard and is used to make Maytag Blue Cheese. John Atanasoff designs and builds the first electronic digital computer while on an Experiment Station research appointment. Experiment Station researchers develop the livestock selection index, a tool used to evaluate livestock traits based on genetics and economic value. First student-managed farm in the nation opens. The AG450 Farm provides hands-on learning for students and continues to do so today. Agricultural climatology research, believed to be the first such research program in the nation, is established. North Central Regional Plant Introduction Station opens to preserve and distribute plant seeds gathered throughout the world. It is a joint venture of the USDA Agricultural Research Service and the 12 north-central state experiment stations. Lanoy Hazel, professor of animal science, develops back fat probe. It is the first scientific tool that allows swine breeders to measure fat cover on live animals and helps reduce fat by 40 percent. 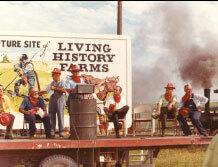 Rural sociologists George Beal and Joe Bohlen develop the diffusion of innovation approach, which became the foundation of every social change program throughout the world. The Experiment Station’s Corn Insects Laboratory releases the first corn variety resistant to the European corn borer. 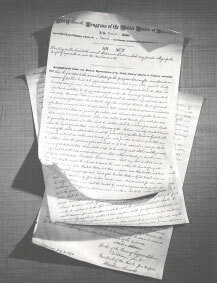 The Center for Agricultural Adjustment is the first to use quantitative analysis to study policy to address the changes in the agricultural economy. The center is renamed the Center for Agricultural and Economic Development in 1961 and the Center for Agricultural and Rural Development (CARD) in 1971. Iowa State College of Agriculture and Mechanic Arts name is changed to Iowa State University of Science and Technology. A poultry gene complex important to disease resistance and immunity, previously known only in humans and rodents, is first discovered. Agronomy department begins using audio-visual equipment for some course instruction. Agronomy department organizes plant breeding symposium, attracting agronomy specialists from throughout the world. Wesley Buchele, professor of agricultural engineering, and graduate student Virgil Haverdink develop the first large round baler. Bill Murray, economics professor, helps establish Living History Farms in Des Moines. The farm is set up to preserve Iowa’s rural heritage for future generations. Global Agriculture Programs office opens, providing study abroad opportunities. Iowa State University hosts world food conference. Iowa State houses the Largest agricultural college in the nation - 20 percent of its graduates go into farming, 20 percent go to graduate school, 25 percent go into business or industry and 35 percent pursue a variety of careers. Ag Career Day is started by the student Agricultural Business Club. In 2006 it is the largest ag career fair in the nation. First international sausage and processed meat short course program is established. Wayne Rowley, entomology professor, begins a statewide mosquito monitoring program after a child in Wisconsin dies of a mosquito-borne illness. The nation's first extension climatologist is appointed in the agronomy department. Turfgrass field days are started at horticulture research station. The Iowa Farm and Rural Life Poll begins surveying Iowans about rural life and continues today. 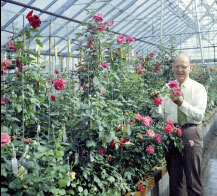 Griffith Buck, horticulture professor, develops “the bluest rose in the world.” From 1962 until his death in 1991, Buck released 87 rose varieties, and many are grown at Iowa State’s Reiman Gardens. The Meat Export Research Center develops round bacon, which is used in fast-food sandwiches. Leopold Center for Sustainable Agriculture is established. First field-test of a genetically engineered tobacco plant containing a pest-resistant gene is done. First exchange program with Lenin All-Union Academy of Agricultural Sciences is established. First field-test of a genetically engineered poplar tree implanted with a pest-resistant gene is done. Researchers use ultrasound to measure fat on live animals. 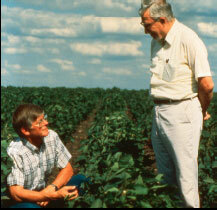 Walt Fehr, agronomist, and Earl Hammond, food scientist, develop a soybean that is low in saturated fat. It is recognized as one of the top 100 innovations of 1991. Nick Christians, horticulture professor and researcher, patents corn gluten meal to control weeds. Researchers develop biodegradable spoons, plates, and cups from corn and soybeans. Iowa State hosts first International Crop Science Congress. The college builds the first linear accelerator facility to conduct food irradiation research. Brenton Center for Agricultural Instruction and Technology Transfer opens to facilitate distance education. The Plant Transformation Facility opens. It is the first public facility used to insert genes into the genetic material of corn and soybeans. First organic crop specialist is hired at a land-grant university. First master’s degree in agronomy via distance education is offered. Animal scientist develops nutritional supplement for AIDS and cancer patients fighting muscle loss. Agronomy department receives an endowment of $80 million, the largest private gift in Iowa State history. Iowa State, the Northeast Iowa Dairy Foundation, and the Northeast Iowa Community College open the Dairy Center in Calmar. First sustainable agricultural graduate degree program is established at a land-grant university. The West Nile virus is found in Iowa. Entomologists at the Iowa State Medical Entomology Lab, which began in 1978, monitor mosquitoes in Iowa. 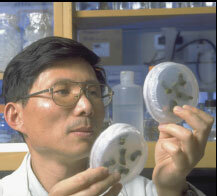 First graduate course in the nation to address crop bioterrorism is offered. Endowed gifts provide more than $1 million in scholarships for students. Meat science program is ranked first in the nation by Meat & Poultry magazine. Researchers design fertilizer application system, reducing the amount of fertilizer applied to crops, that is named top new technology by the American Society of Agricultural Engineers. Ultrasound technology helps researchers produce an Angus cow that is ranked first in the nation by the American Angus Association. Beef breeding selections are based on the amount of intramuscular fat or marbling. Science with Practice programs give students the chance to earn credits and work in areas that are in-line with their studies. 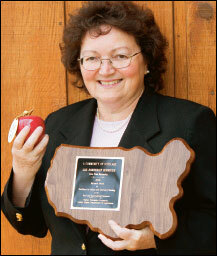 Gail Nonnecke, horticulture professor, is awarded the annual USDA Food and Agricultural Sciences Excellence in Teaching Award. She is one of only two people to receive the national award, which encompasses all the food and agricultural disciplines. Scientists study alternative crops for fuel production. Construction begins on new Iowa State dairy farm south of Ames. Animal scientists coordinate national tracking of animal genome research. Improved technology makes it possible to examine the genome of a whole organism. Iowa State Turf Bowl Team wins national champion for the sixth year in a row and the eighth time in the past nine years.